IPA's are nothing new to New Belgium, and now they've upped the stakes and have created a more mainstream Double IPA called New Belgium Double India Pale Ale. This beer comes in draft, 6-packs and even 22oz bomber bottles. For this review, a 22oz bomber was chosen in order to get just enough brew to give a decent valuation. This beer just came out about a few weeks ago and already there has been a lot of press on it. 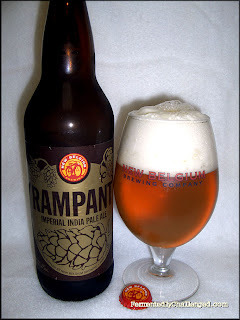 Rampant Double IPA (DIPA) is designed to engage your senses with something more than the average hoppy beer. It's bold weighing in at 8.5% ABV and was meant to be consumed shortly after purchasing. There is even an expiration date on the label that lets you know you should consume this within 4 months of it's release (by early July 2013). So don't even think about aging this. IPA's never should be cellared. New Belgium's label proclaims that the drinker may find some heavy peach tones with herbal sweetness and aromatic complexity. Peach eh? I've seen hops that remind me of many different fruits, but never peach. We'll see. 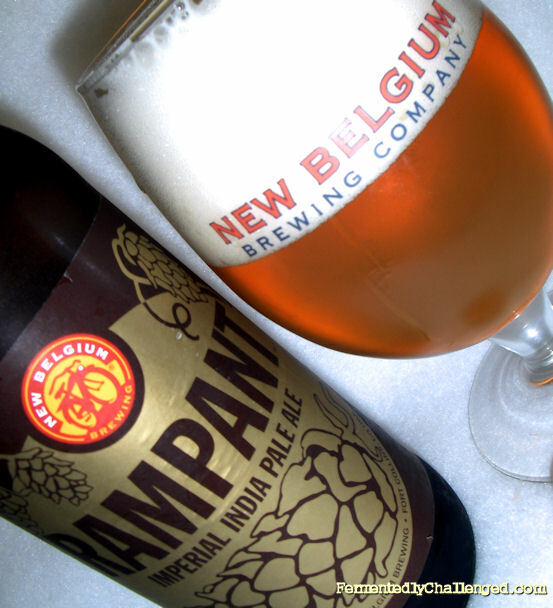 Appearance: New Belgium's Rampant poured an amber-gold color with a tall bright white head. The beer had excellent clarity with no visible sediment, not even any at the bottom of the bomber bottle. The beer had moderate carbonation, just enough for this style. The head retention was amazing. The 3-finger tall head stuck around for a long time and left a thick white lacing behind in the glass. Just a slight swirl brought back nearly a finger tall head each time. This beer had great "head" so to speak. Aroma: The air was immediately filled with the scent of citrusy fruit and pine forest. The fruit reminded me of a sweeter version of grapefruit, but not peach. The hops gave off an aroma that I've come to seek out and enjoy in an IPA. This being an Imperial IPA, the aromas seemed beefed up a bit. There was a certain spice/herb component to the smell too. It was very fresh and inviting. Despite being a big 8.5% ABV, the alcohol did not dominate the aroma. Taste: Rampant didn't go "rampant" on me with harshness, rather, at first sip I could pick up some of the slightly sweet base malts, but then was followed immediately with a distinct hop bitterness. At the end of each sip, the brew turned again to a clean, refreshing finish that brought back a smooth mix of malt and hops. This beer finishes really well after the initial shock to the system of the hops. While at first it seemed like Rampant was going to be a tongue coater filled with sticky bitter hops, it instead cleaned itself up mid-taste and left a surprisingly clear palate. It left me wanting the next sip right away. Among the sweet malts, there was a hint of citrus, a touch of herb (not much) and just a slight lingering hint of resiny hops. Amazingly enough, as the beer warmed up, the beer seemed to constantly change around. The colder is was, the sweeter it seemed, and then as it warmed the hops became more center of attention. Despite all that, this beer had a light to medium body that didn't stay chewy. That's a nice change from other sticky/chewy DIPA's. Overall: After spending most of the winter with dark beers, this was an excellent brew to break out of the seasonal mode and get into a beer that felt more like a good old fashioned intense, yet refreshing, Double IPA. 6 years ago, you couldn't have convinced me to like this beer, however today with a more trained taste, this beer was a real pleasure to drink - start to finish. I think New Belgium found a beer that a lot of people will enjoy. I must admit, the higher alcohol is something also to pay attention to. I suggest splitting this bottle with 1 to 2 friends. The true IPA lover may overlook its strength and go for a whole bomber. Disclosure: I paid full retail price for this beer at my local liquor store. - New Belgium Fresh Hop IPA review. - Dry Dock Double India Pale Ale review. - Odell Myrcenary Double India Pale Ale review. This article came from FermentedlyChallenged.com - a Colorado beer blog. Don't miss another article. Subscribe to Fermentedly Challenged by RSS today.